The Franciscan Monastery’s gardens have been an oasis of quietude for over a century for visitors from all over. The serenity of these formal and informal gardens attracts not only visitors marveling colorful beauty, but birds and other wildlife also find peace in the tranquil gardens. Although the gardens are particularly known for their prized rose beds and formal ornamental gardens, intermingled among the landscape are replicas of shrines and chapels of the Holy Land. The gardens had their beginnings in August of 1897 when Reverend Godfrey Schilling O.F.M. (1855-1934), founder of the Franciscan Monastery of Washington, DC, stood on a rise of overgrownland, once the grand estate of the McCeeney family. Rev. Schilling saw beyond the neglected estate. He pictured acres of fertile land with the potential for an orchard, a vineyard, a vegetable garden and a dairy to support the new Monastery. His vision included flowering gardens with reproductions of shrines of the Holy Land for all to visit and enjoy that was nearby. Within months, six Franciscan Friars joined Rev. Schilling in an adventure to establish a Monastery community. These Friars became known as the “Pioneer Brothers.” The first of the “Pioneers” to arrive was Brother Isidore Germait of Belgium (1837-1912) and he worked as the Monastery’s first gardener. Other Friars, notably Brother Meinrad Wiget of Switzerland (1880-1967), added to Brother Isidore’s pioneer landscape design and plantings. For more than 60 years, Brother Meinrad spent seven hours a day caring for the grounds of the Monastery. His affection for and rapport with the gardens led to a landscape style that combined formality with the native wildness of the acreage. It was during Brother Meinrad’s tenure that the beauty and tranquility of the gardens began to attract pilgrims from around the world. Brother Meinrad understood a blended approach in creating a nationally-known garden. “When I find a spot somewhere and I’ve got some plants left over, I put ‘em in,” Brother Meinrad once said. “In my little way,” he said, “with the nurturing of these flowers, I hope to lead as many souls as I can to God.” In keeping with the Franciscan tradition that God is revealed to us through his creations, the Monastery Gardens were designed and are preserved for all visitors. It is a garden retreat for meditating and for renewing the soul. By the mid-1990’s, the Friars needed assistance to tend the beautiful gardens they created, and have hired landscape companies to maintain the gardens in the Franciscan tradition and spirit of the land. Joe Arseneault, a partner of Greensmiths, Inc., was the first landscape gardener to manage the monastery gardens, and continued to do so until 2007. Ruppert Landscaping Company was responsible in 2007 to 2009, and Level Green Company maintains this responsibility in 2009 and 2010. Sometime during the early summer of 1998, Elizabeth Sarantos, who often worshiped at the Monastery and was a fervent admirer of the gardens, approached Franciscan Friar John Sebastian, and inquired if there were any volunteer gardening activities one could do to assist the Monastery. Brother Sebastian prepared a questionnaire to test the interest of other lay people and a fact gathering meeting was held on September 26, 1998. “The Franciscan Monastery Garden Guild (FMGG)” was chosen. Elizabeth Sarantos became the first president, Ted Lemanski served as secretary, and Ben Hill was the first treasure. Joe Arseneault and Sylvia Cormier led the effort to develop the mission statement that remains unchanged today. Monastery, we, the “Franciscan Monastery Garden Guild”, is so formed with The Holy Spirit as our guide and inspiration. We set forth its goal and purpose with St. Francis as our model. In keeping with the Franciscan tradition that God is revealed to us through His Creation, our purpose is to promote and preserve the gardens at the Franciscan Monastery. We aspire to continue to provide visitors and pilgrims with a garden sanctuary where they can seek, find, and be reconnected with their creator. As sisters and brothers in Christ, we dedicate ourselves and our work to the service of the Franciscan Monastery and all humanity. One of the first major projects of the Guild was to add a purple martin house to the gardens. When it was determined that a 14-unit purple martin house would cost about $700 more than the treasury contained, a member volunteer with major help from a next door neighbor, provided the structure in time for the 1999 spring migration. The martin’s hotel was successful in attracting the residents for the next two years. 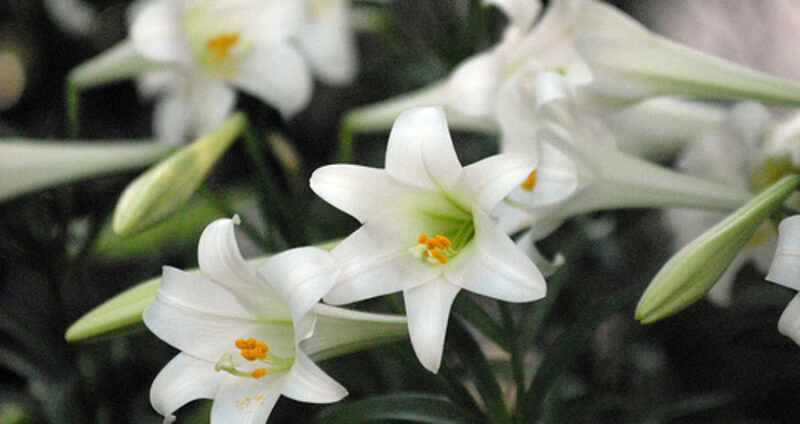 The first fundraiser to increase the treasury was what has now become a “holy” tradition, namely the sale of Easter lilies on Palm Sunday weekend. At the suggestion of member and former Brookland resident, Rita Giovenco, we have since added palm crosses to the inventory at Palm Sunday. Loyal customers have been coming every year since 1999 to the Portiuncula Chapel where we distribute the lilies and palm crosses. Our first annual “Herb and Plant” sale took place on April 24-25, 1999, and we sold almost everything we had available for sale. Our profit was just a little more than $700 but we had thought we had hit the lottery. Our treasury had barely passed the thousand dollar mark, but we were finally able to help the Monastery gardens, even though we only bought a few plants and replaced a couple of rose bushes on the grounds. The Herb and Plant sale has grown significantly in popularity. Our inventory has increased several fold and we invite vendors offering crafts and foods. At Christmas time of 2000, the Guild introduced our Luminaria program, “the Seven Nights of Lights.” The luminarias are lighted on Christmas Eve in the Rosary Portico and burn through New Year’s Eve. Based on the responses and donations from the benefactors and the public, the Guild places the names of loved ones on each luminaria as a Christmas memory. The first three years of the program, we used brown paper bags as the luminarias, but as the program expanded and the weather conditions dictated, we now use custom built (by our members and volunteers), wood and glass luminarias. The Friars, benefactors and members look forward to this event, not only because it is based on the Spanish tradition of welcoming baby Jesus, but also gives the Rosary Portico a gorgeous glow during that magical season. In April 2006, the Guild established a honey bee committee and introduced two beehives on the grounds. This committee has seen a major growth in interest and membership of beekeepers. Our hives have increased, now numbering eleven, and we offer limited quantities of packaged local honey and beeswax soap for sale. A most unique project developed by the Guild and dedicated in September 2007, is an herb garden at the friary entrance. The choice of herbs is based on Biblical references and the location of the garden is in keeping with ancient monastic tradition. The garden features four classes of herbs being culinary,biblical, medicinal and household. Here one finds fennel, oregano, lavender, thyme, feverfew, figs, monkshood, anemone, sage soapwort, yarrow and mugwort. On the tenth anniversary of the Guild (October 2008), a Beneficial Insect and Butterfly Memorial Garden was dedicated. The garden features perennial plantings and aquatics to attract native insects and butterflies, as well as sheltering fish in the water feature. On April 2, 2009, the Guild was formally certified as a 501(c)3 non-profit corporation. As the Guild enters this phase of its maturity, there are many potential opportunities for growth in garden projects and garden-related activities. It is amazing in this day and age to see a private garden such as this monastic garden, open free of charge to the public. However, this is what the Guild together with the Franciscan Monastery, is committed to achieve. The Guild depends on its members and volunteers to do the work to help keep these historic gardens a living reality. Even though the Guild has continued to grow since it was founded, there is a constant need for more members and volunteers.